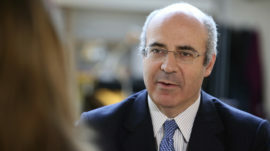 Russia has asked Interpol for the seventh time to arrest Bill Browder, a London-based Kremlin critic who leads a campaign to punish Russian officials for the 2009 death of his lawyer Sergei Magnitsky, according to a letter seen by Reuters. Interpol’s Commission for the Control of Files wrote to Browder’s lawyers to say that Russia‘s National Central Bureau had requested his arrest for charges including deliberate bankruptcy and tax evasion. “The NCB of Russia has authorized the Commission to disclose to you its wish to request police cooperation for your client through an Interpol diffusion to arrest,” Interpol said in a letter dated Jan. 21, 2019. Interpol’s eight-person Commission, which includes a Russian lawyer previously involved in drafting Russian state requests for assistance in pursuing Browder, will consider Russia‘s request on April 15-19.